Over 117,000 square kilometres of the wide search area have been analysed and mapped. Fugro Equator continues bathymetric survey operations. Over the next four days, sea states in the area assigned to Fugro Equator are expected to range from 1 to 4, providing good conditions for the survey work. Vessels involved in the search are being jointly funded by Malaysia and Australia. Fugro Discovery and Fugro Equator (which is currently being used to survey the search area) are Fugro Survey Pty Ltd vessels, and GO Phoenix has equipment and experts provided by Phoenix International (Phoenix). On Monday, 6 October 2014, GO Phoenix arrived in the vicinity of the search area and, following system checks and vehicle deployment, underwater search operations commenced on the 7th Arc. The vessel is expected to continue operations for around 12 days before sailing to Fremantle to be resupplied. Fugro Discovery arrived at the Port of Fremantle on Sunday, 5 October. Search equipment and a mission crew are being mobilised. Trials will be conducted to ensure the equipment is calibrated and functioning correctly, and the estimated day of departure is 11 October. The vessel will then travel to the assigned search area in the southern Indian Ocean. Over the next four days, sea states in the area assigned to GO Phoenix are expected to range from 1 to 4 providing good conditions for the search. The ATSB, in consultation with the contracted search experts, is in the process of finalising the plan for the underwater search, to be followed and referred to by all parties involved. The plan will include search timings, methods, procedures, safety precautions and search areas. The initial search areas have been identified and allocated to the different search vessels. The first area to be searched has been assigned to GO Phoenix. It has already been surveyed to ensure an accurate understanding of the sea floor topography. The second area, assigned to the Fugro vessels, is currently in the process of being surveyed. Work is continuing with refinements to the analysis of the satellite communication system messages. This ongoing work may result in changes to the prioritisation and location of search activity. Malaysia Airlines Flight MH370 went into a slow left turn and spiraled into the Indian Ocean when its fuel ran out, an interim report concluded Wednesday, pointing investigators towards the southern section the current search zone. Flight simulations recreating the final moments of the aircraft, which vanished March 8 en route to Beijing from Kuala Lumpur, suggest it entered “a descending spiraling low bank angle left turn” and hit the ocean “a relatively short distance after the last engine flameout,” the Australian Transportation Safety Bureau (ATSB) said in an update [PDF link]. Latest update: Australian authorities released their first update on the latest underwater probe for missing flight MH370 Wednesday, saying more than 670 square km had been searched without success. The Boeing 777, which is believed to have crashed into the southern Indian Ocean after inexplicably veering off course, is now the subject of a renewed underwater hunt far off western Australia. The Australian Transport Safety Bureau (ATSB), which is leading the search, said the Malaysian-contracted vessel GO Phoenix was continuing to conduct underwater search operations. The underwater search began on October 6 and followed a survey to map the seabed. About 127,000 square kilometres of the search zone has been mapped so far. Sophisticated vehicles attached to the ship by tow cables have been programmed to detect the biggest parts of the aircraft likely to be in one piece, such as engines and fuselage. "GO Phoenix continues to conduct underwater search operations," the ATSB said. "At one point, operations were halted in order to recover the deep tow vehicle and rectify a cable connection fault. Operations were quickly recommenced." GO Phoenix is searching the area considered the most likely final resting place of the plane, based on detailed analysis of the aircraft's satellite communications. A second ship was preparing to join the hunt for Malaysia Airlines Flight 370 in a remote patch of the Indian Ocean on Wednesday, as Malaysia's defence minister expressed confidence the plane will be found. The Discovery, provided by Dutch contractor Fugro, was scheduled to arrive in the search zone about 1,800 kilometres west of Australia on Wednesday, the Australian Transport Safety Bureau said in a statement. The GO Phoenix, a Malaysian ship that has been combing the area since early October, is in the Western Australian city of Fremantle getting fresh supplies. The underwater search resumed in early October after being on hold for four months while crews mapped the seabed in the 60,000-square kilometre search zone. The GO Phoenix has searched over 1,200 square kilometres so far. Australian officials are still receiving reports from people who believe they have found wreckage washed up along the Australian coastline, but all have been false alarms. Drift modelling by the Australian Maritime Safety Authority has shown any floating debris would likely have travelled west, away from Australia. Because of that, Australia asked Indonesian officials to be on the lookout for any wreckage, as it is possible some may have drifted to the island nation's coastline, the transport safety bureau said. Meanwhile, a third ship, the Fugro Equator, is still mapping areas of the search zone and will join the hunt once that is complete, likely in the next week or so. Thank you for keeping us up to date, graceland. It's so sad to read there hasn't been even one piece of debris found to date. I hope there will be answers someday. You're welcome, MuffyBee! It is sad that no debris has been found yet. Maybe with the alert to Indonesia to be on the lookout, it might help in finding something on one of the 1,000 inhabited islands. Australian officials say the hunt for missing Malaysia Airlines Flight 370 in a remote patch of the Indian Ocean is progressing well but is likely to take many months because of huge area involved. An Australian search coordinator, Peter Foley, said on Friday there is optimism with two ships using high-tech sonar devices to search for the Boeing 777, which disappeared in March while flying from Kuala Lumpur to Beijing with 239 people on board. He said weather is improving and they hope to cover as much area as possible. 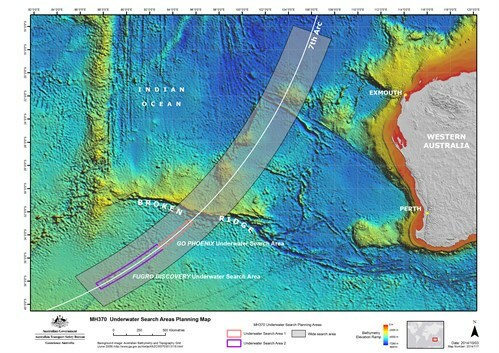 The search for signs of Malaysia Airlines Flight 370 (MH370) is set to accelerate in the coming days, as a third vessel transitions from survey work to searching the vast seafloor area that has been mapped out and surveyed, the Australian Transport Safety Bureau (ATSB) said. The underwater search—which ATSB said is the latest phase in a search for the missing aircraft, a Boeing 777-200 carrying 239 passengers and crew aircraft that disappeared on March 8 during a flight from Kuala Lumpur to Beijing—is divided into two stages. 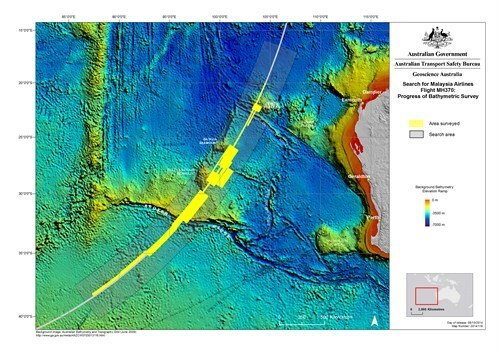 The initial stage was bathymetric survey of an area along an arc that ATSB and other investigators determined was the most likely termination zone for MH370. The last ship involved in the surveying, Fugro Equator, finished its work Oct. 26 and is being reconfigured so it can join two other vessels, Fugro Discovery and GO Phoenix, already searching areas surveyed in recent weeks. “The ATSB has utilized the data from the bathymetric survey work to prepare the initial plan for the underwater search, to be followed and referred to by all parties involved,” ATSB said. “The plan includes search timings, methods, procedures, safety precautions and search areas. The initial search areas have been allocated to the different vessels with the aim of positively identifying and mapping the debris field of MH370.” The search vessels are being funded jointly by Australia and Malaysia, ATSB said. Vessels involved in the search are being jointly funded by Malaysia and Australia. Fugro Discovery and Fugro Equator are Fugro Survey Pty Ltd vessels, and GO Phoenix has equipment and experts provided by Phoenix International. With the commencement of the underwater search phase, there has been much talk about ‘the search recommencing’. It is important to note that the search for missing Malaysia Airlines flight MH370 in the southern Indian Ocean has been continuous since March 2014. Whether it was aircraft scouring the surface of the ocean for floating debris or a ship conducting bathymetric survey operations, the effort has not stopped. This week the current bathymetric survey work was completed. KUALA LUMPUR, Malaysia -- Two Malaysian children sued Malaysia Airlines and the government on Friday over the loss of their father on Flight 370, the first lawsuit filed in the country by relatives of those aboard the jetliner that mysteriously disappeared eight months ago. Jee Kinson, 13, and Jee Kinland, 11, accused the civil aviation department of negligence for failing to try and contact the plane within a reasonable time after it disappeared from radar while flying from Kuala Lumpur to Beijing on March 8 with 239 people on board. The suit filed at the Kuala Lumpur High Court alleges the airline was negligent and failed to take all due measures to ensure a safe flight. It also named the directors-general of civil aviation and immigration, the country's air force chief and the government as respondents and alleged they committed gross neglect and breach of duty. Poor weather is affecting the search for missing Malaysia Airlines flight 370, but conditions are expected to improve over summer, as vessels continue to scour the ocean floor. More than 3000sqkm has been searched so far, and more than 160,000sqkm has been mapped. If needed, further bathymetric survey operations could start again later, the Joint Agency Co-ordination Centre said in its latest update. The vessel GO Phoenix resupplied in Fremantle and began its underwater search on Tuesday. Fugro Discovery was searching the area last week, but had to suspend operations on Friday due to severe weather. The deep tow vehicle was recovered to a safe depth and its operations resumed on Monday when conditions improved. Fugro Equator returned to Fremantle last Friday and will depart next week after being reconfigured to accommodate a deep tow vehicle identical to the one on Fugro Discovery. The current bathymetric survey work was completed on 26 October and all data has now been analysed with a total area mapped of over 160,000 square kilometres. GO Phoenix commenced underwater search operations on 4 November. Over 3,000 square kilometres of the ocean floor have been searched to date. GO Phoenix departed Fremantle after resupply and commenced underwater search operations in the search area on 4 November. Fugro Discovery continued search operations during the week, but was required to suspend operations on Friday 31 October owing to severe weather. The deep tow vehicle was recovered to a safe depth of 1000 metres and the vessel proceeded on an appropriate course and speed until conditions improved. On 3 November, Fugro Discovery recommenced search operations. Fugro Equator arrived at Fremantle on 31 October and commenced mobilisation as the third underwater search vessel. This process involves reconfiguring the vessel to accommodate a deep tow vehicle identical to that currently in use by Fugro Discovery. Fugro Equator is expected to depart for the search area in the coming week. The Australian Transport Safety Bureau, or ATSB, denied speculation that the GO Phoenix, a vessel involved in the search for missing Malaysia Airlines Flight MH370, had found something that prompted it to stop in the southern Indian Ocean for nearly 24 hours, News Corp Australia reported Monday. The Australian vessel had joined the search on Tuesday. An ATSB spokesperson reportedly said that GO Phoenix experienced an issue with its towfish over the weekend, forcing it to halt the search at the location, which has been considered as the probable crash site of the missing Boeing 777. Bad weather conditions have reportedly hampered the search operations, which resumed Wednesday with three survey vessels -- GO Phoenix, Fugro Discovery and Fugro Equator. A towfish is a sonar scanning system that can be towed alongside a ship and has been used to look for the missing plane. “The issue has been rectified however severe weather has delayed a safe redeployment of the towfish and recommencement of search operations,” the spokesman reportedly said. American search watcher Mike Chillit, who has closely followed the vessel’s operation on satellite maps, said earlier that the sudden halt of the vessel in the last couple of days could be because it had found something of importance to the search mission. Meanwhile, relatives of the passengers of MH370 criticized Malaysia Airlines after reports surfaced that the company might officially declare the jet lost by the end of the year. The families reportedly said that the decision is “agonizing and confusing” as the search for the jetliner resumed in September after a four-month long break. The comments by Malaysia Airlines' Director, Hugh Dunleavy on 4 November 2014, claiming that Malaysia will be issuing a statement of loss for flight MH370, are greatly disturbing for the families and loved ones of the passengers and crew on board MH370. We note that overnight Malaysia Airlines has issued a statement advising that Mr Dunleavy's comments were a personal opinion only, and also highlights that the company is not involved in any way in the search activities. Under international convention the Malaysian Government carries overall responsibility for the search and any declarations in relation to MH370. GO Phoenix suspended search operations to rectify an issue with the tow cable. There was a subsequent delay to safely relaunching the towfish due to poor weather. After a 48-hour delay, the vessel recommenced operations. Fugro Equator's mobilisation has been delayed due to some issues with the deep tow winch and cable. Over 4,800 square kilometres of the seafloor have been searched so far. Fugro Discovery departed the underwater search area on 18 November to transit to Fremantle for resupply. The vessel is expected to arrive on 23 November and depart again for the search area on 24 November. Fugro Equator's mobilisation for the underwater search has been postponed due to delays in the supply of equipment. In the interim, the vessel has been tasked to return to the search area to conduct further bathymetric survey work. Over 6,900 square kilometres of the seafloor have been searched so far. A video titled Search for MH370 has been uploaded to the JACC website at www.jacc.gov.au/media/video/index.aspx. The video aims to explain the activities and complexity of the search effort to date, for families affected by the disappearance of Malaysia Airlines flight MH370. The video is available in English, Malay and Mandarin and can also be downloaded from www.jacc.gov.au/media/video/search_for_MH370.aspx.